Mark your calendar for June 1, 2010, 7pm at the senior center. All shareholders are cordially invited to attend. The board was asked why tenants were paying monthly a/c charges ($15/unit) if they were being forced to remove them for construction work. In a normal building, none of this would be an issue because each apartment’s electricity use is measured and there is no special a/c fee. Because Luna Park doesn’t have the ability to do this (yet), our electricity costs are bundled into our maintenance. When the heavy duty power outlets were put in, the board had to decide how to share the higher cost for a/c energy and they did the best they could. The basic idea is that the cost for an a/c unit’s use in the hot months is estimated and then split out over twelve monthly payments. This is why we pay an a/c fee in winter months too. The question for us was how to determine what to charge or credit someone forced to take out an a/c? We’ve come up with what we think is a fair answer. Although we know that sometimes a/c’s are used even in winter, on average, the most use is in the hot months of June, July, August, and September. For one a/c unit at $15 per month, a tenant will have paid $180 for the entire year. If we divide that annual sum of $180 by the four hot months it comes to $45 per hot month for the use of one a/c. Each tenant will be credited $40 per hot month they’re forced to remove their a/c and the $5 difference will count toward the other 8 months. To be clear, you will get the $40 credit for the month ONLY if you are forced to remove your a/c that month. If your a/c is removed June and July but back in for August and September, you will only get credit for those first two months your a/c was out. To give an example, let’s say you live in building #5, wing 2956 and started in January 2010 with one a/c on your account at $15 per month and your maintenance is $600. In March you’re asked to take the a/c out of your window and you’re only allowed to put it back in August. Every month in 2010 you will pay $615 EXCEPT in June and July when you only pay $575. If you have three a/c units, in that example you’d pay $645 every month in 2010 except June and July where you’d pay $525. You don’t have to do anything; it will automatically be reflected in your account. Any wing receiving the credit will have those a/c lines powered off, beginning the morning of June 1st. After a couple random pics made their way onto the blog here, I asked Mark Tsalner, a resident of building #5 and professional photographer (he owns PhotoFXStudio.com) if he’d be willing to do a free set of pics for us. He generously agreed and you can follow the link below for the full gallery. Click to view all the pictures. Thanks Mark and also thanks to Mike Jennings from Technical for taking time from his busy day to show Mark around. I attended last night’s informal meeting along with some other directors and I wanted to post some of my own personal thoughts. First, I’m sorry that shareholders called that meeting; the directors should’ve been the ones to call it but we dropped the ball. That hit me the moment I saw the flyer. Most of the questions had straightforward answers and that was the worst part because we could’ve saved a lot of confusion if we’d gotten those answers out earlier. We’ll do better on modes of communication and the information we send out. We have a couple of things in the works that will help and we’re going to announce a town hall meeting very soon but have to first make sure all the invited guests will be available on the proposed date. A point was raised about the meeting minutes. They do need to be more detailed and I’m going to ask the board to once again show names associated to motions and votes. I was initially for the anonymity but I can admit I’ve made the wrong choice when presented with a good opposing argument. A point was raised about the a/c charges for people who’ve had to remove their units due to construction. The board has researched and debated this before; it’s made complicated by a number of factors which I won’t go into here but they’re no excuse for not doing something reasonably fair. I made a promise to the tenant who brought this up that I’d make it my priority to find a solution and propose it to the board. I intend to accomplish that today and have something to announce shortly thereafter. I was also called a crook and part of a complicated conspiracy which I believe is how Luna Park officially welcomes all its new board members. A gift certificate to the local diner would’ve been nicer but I’ll take what I can get. I am writing to you about the construction around Building #5 of Luna Park H.C. It began in September 2009, when the contractor closed a part of parking lot 5 and, in addition, unnecessarily closed the front entrance to the building with the equipment that should have been used for only 2 or 3 days. Now it looks like the entrance will be closed till the work will be done. The tenants in the building, especially the elderly, ill or sick people, are suffering a lot: it takes them a lot longer to get out of the building and a lot more time to get to their cars. The office has explained to us that everything is done for our own safety, but it takes a very long time: they work only 40 hours per week, but we live here 24 hours, 7 days per week. Alex Meshoyrer, Apt. #17M, had tried to make an appointment to discuss this matter but never received one. We, the tenants of the Building #5, ask you to help us, because there should be a fair way to solve this problem. The board has allowed me to draft the response from my personal view because I’m also in building #5. First, I’d like to clear up some facts. I joined the board in November and at the time Technical were still moving stuff onto the lawn and the route to parking lot #5 was open. I don’t remember when the route to parking lot #5 was closed or when they took over that piece of the lot but the front entrances were closed on January 19th. I know this because I have emails from that day asking Tony to arrange those orange arrow detour signs. Alex Meshoyrer may have had initial difficulty getting his appointment because we had no general manager at the time, I don’t know the details, but I’m told that he’s had 4-5 meetings with our manager now that we have one. No one is being ignored. I do understand the frustration. I’m not sick or old but the inconvenience is still considerable for everyone. Last week I met with the site supervisor for Technical Construction, Mike Jennings, and our own Director of Operations, Tony Donadio, to see why we can’t use one side of our front entrance while the other is being worked on. It’s important to note that while walking in that area I had to wear a hardhat. They explained that there’s no way the area can be considered safe while work is being done on either of those wings. It’s not personal opinion, there are rules and regulations that govern site safety and we must comply. No one involved wants there to be suffering or inconvenience. Who could imagine that to be true? No one’s happy about it. They even discussed some pretty wild ideas like running a ramp down from the second floor but it would take a lot of time and money to build and get approved which would only be wasted once the facade work is done a few months later. It’s a construction area even when the machines aren’t moving. Luna Park has been sued by people falling on a normal sidewalk, what do you think will happen if someone trips on a pile of dirt, hole, or crack caused by the work? What if a dislodged brick falls on someone while they’re in the middle of the brick removal phase on that side? Yes, there were delays which made this worse. 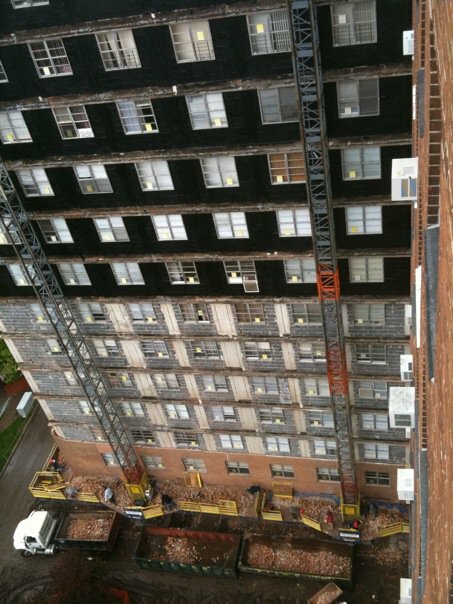 The asbestos removal had to be done, we had to wait on permits, but no one did that on purpose either. The short and bitter answer is that this is unavoidable and will be over in a few months. We should remind ourselves that the extra walk isn’t that bad. We’ve been a bit spoiled because, if you think about it, the distance to the train station is still shorter than any of the other four buildings! Please have patience, it’ll soon be over and once it’s gone it will not be back. As the work moves away from us so will the recent inconveniences and the old ones, like ugly scaffoldings. There is a very bright light at the end of this tunnel. Another from Mark Tsalner presenting a very cool perspective. Please keep ’em coming. 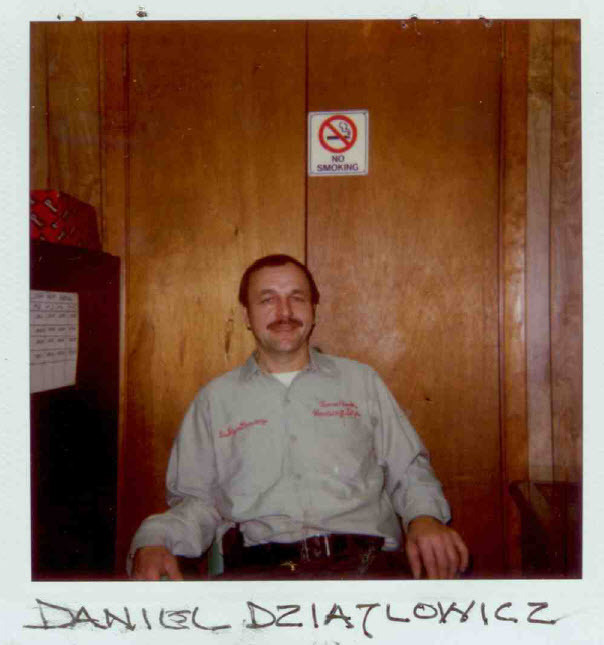 Daniel Dziatlowicz passed away today from an illness he’d been battling. Daniel has served as a boiler tech on Luna Park’s maintenance staff since 2000 and will be remembered for his excellent work ethic and perseverance. He was known as someone you could always depend on. Luna Park’s management and board of directors extend our sincere condolences to the Dziatlowicz family and his friends mourning their loss. Rest in peace, Daniel.